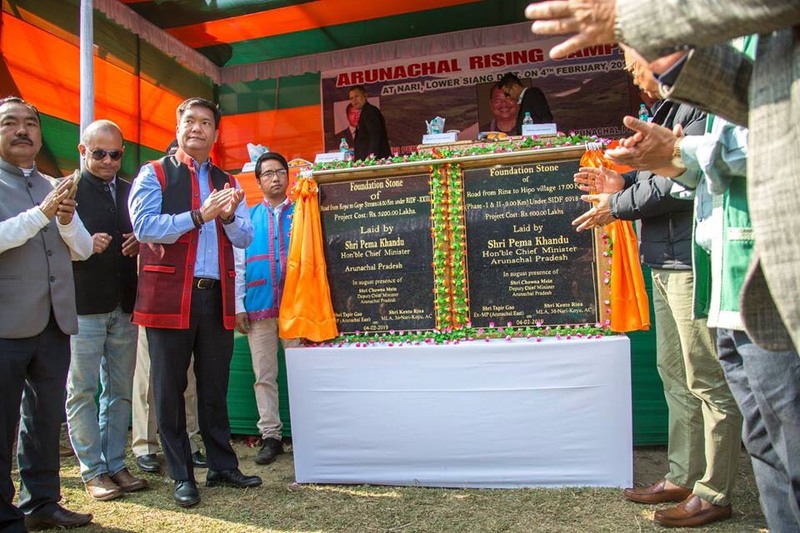 Arunachal Pradesh chief minister Pema Khandu on Monday launched the third leg of Arunachal Rising Campaign at Nari in Lower Siang district in presence of deputy chief minister Chowna Mein and legislators Kento Rina, Kaling Moyong, Tatung Jamoh, P D Sona and Olom Panyang. Speaking on the occasion, the chief minister said to make development inclusive and to fight the past deprivation, the present State Government has emphasized that central schemes be implemented on need basis and not on the basis of pick and choose. “The situation is different today with central schemes being implemented evenly across the state irrespective of the constituencies ruled by ruling or opposition party,” he said. Khandu said many elected officials in the past did not even know about the important central schemes, however, during his course of Jan Sampark Yatra, he got the opportunity to visit every corner of the State and meet people during which they told him about the ways they are coming to know about the government’s flagship programmes. The chief minister also said places such as Tirap, Longding and Changlang districts saw deprivation of central schemes and they were implemented only in few pockets in the State. He further appreciated the district administration for carrying out 15 ‘Sarkar Aapke Dwar’ camps in the district and reaching out to more than 44,000 beneficiaries. “The administration has done commendable job despite shortage of officers and staffs due to the district being newly created,” he said. Khandu further assured the people that within this year he would lay foundation for new district secretariat and all infrastructure works for setting up of district headquarters will be taken up. He also said the issue over location of district headquarters will be resolved in the coming days. On digital connectivity, the chief minister said the centre has sanctioned Rs 1700 crore for the State but the work has been held up due to litigation issues in Supreme Court. He said the matter has been taken up with the Centre to resolve the matter with urgency to which the Centre has assured to take up immediately.